Do you need to organise your wine bottle collection? 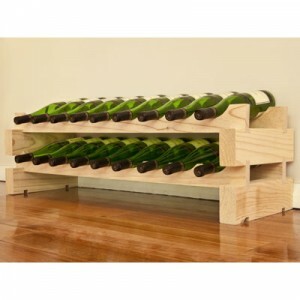 Are you looking for a sturdy, reliable wooden wine rack? Well we have the perfect competition for wine lovers! For your chance to win a Modularack Wooden Wine Rack 18 Bottle – Natural Pine (RRP: £41.95) enter our rafflecopter competition below. Closes 03/05/13. The Modularack wooden wine rack 18 bottle in natural pine is easy to assemble, as no tools required; simply slot the pieces of wood together! The Modularack system allows you to grow your wine collection without worrying about the size of your rack. You simply add another layer as and when your bottle collection increases. This fantastic wine rack is made from Australian pine and the unfinished wood gives you the option to paint or varnish it! So where will you put this stylish wine rack if you win? Leave us a comment below! Visit our Wineware YouTube channel for the latest product reviews, tips and advice. Would look lovely in my kitchen. The pine would fit in well with my light coloured units. Fab prize. In the dining room next to the cabinet with my wine glasses in. IN THE SPARE ROOM, WHERE IT IS COOL. In my kitchen so it’s nice and handy! In the kitchen, next to the drinks cabinet! In my kitchen,it would look good especially full! In the dinning room for all to see. I would put it in the kitchen up the other end so as it was on show and would look lovely on display. I’d show off this beautiful wine rack in the dining room. I would put it in my kitchen, i’d just need 18 bottles of wine to show it off! In the hall, under the stairs, where it would have room to grow. On display in my living room, filled with lovely treats! I would put it in my conservatory and fill it with red wine! This would go in my kitchen for all to see! Not sure how much wine would be in it though! It would take pride of place in the kitchen – I couldn’t resist not showing it off! In a room where everyone could stand and admire it so I think the living room would be the best place. I store all my wine in the garage where it’s nice and cool, so it would go in there. In the dining room. It looks amazing. In my porch – it’s pretty cold in there so would keep it nice and cool! I’d find a space on my kitchen work top – so it’s near! It would be amazing in my kitchen! I think the other half would like to see it taking pride of place in the kitchen so he can see all his wine options! I would put it in our conservatory which is also our chill out room and bar. In my kitchen, it would look great! We’re having anew kitchen put in soon, so it would have to go in there! I would store this in my out house as its an old concrete building so its cool and dark even in the summer great place to store wine. in the centre of my kitchen worktop. In my garden room ready for spring and summer entertaining! as my family and friends walk by. In my kitchen, I have the perfect space in the corner for it! The gap above our kitchen cupboards looks like a perfect fit to me. It will look like Nelson’s gun deck with all the cannons pointing down! I would put it in the dining room so it would be near the dining table and I could access it easily. I’d put this stylish wine rack in my stylish Dining Room to show it off. I’d put it on top of my kitchen cupboards – nice and handy! I would place it in my spare room as it is cooler! Great to see so many entries. Good luck to you all! In my understairs cupboard which also acts as my wine cellar. This practical design would be a great space saver. It will have pride of place in our dining room. On the worktop in my kitchen. In the kitchen where it’s easy to get at quickly! In my lounge next to my fish tank, that way I’ve got two lovely things to look at ! In my kitchen once I finish redecorating. In our pantry 🙂 It’s lovely!! In my kitchen, we’re hoping to get a new one soon. In my cellar because that will keep my husband away from it. He’s scared of the spiders down there! In pride of place in my sitting room. This will go perfectly in my newly decorated dining room. In pride of place in my kitchen! I love to put it in a cellar in my huge house but sadly I don’t have a huge house, maybe in our shed then! I would make this a centre piece on a very bare wall/floor in my kitchen. In the bedroom as its the coldest place! Only got room in the lounge,so will have to be there! This will go on the kitchen windowsill. I have a spot it would be perfect in in my kitchen. In the airing cupboard. It’s dark, I don’t turn the heater on so it’s cool, and as I don’t have a cellar, seems the best place. It’s also where I’ve got some blackberry wine on the go right now. Got a perfect space for this next to my fridge! Probably in the kitchen, – It’s all wood so it’d fit perfectly! Under the stairs so i can show it and the wine off!